The time has come, Time Lords! Our 2019 CONsole Room schedule is now available. Take a look now and start planning out your weekend today! View our 2019 schedule HERE. We have so many exciting things in the works for CONsole Room 2019 to be held JANUARY 4-6! With Guests of Honour KATY MANNING and NEVE MCINTOSH and a host of amazing Featured Guests, #WhoItYourself events like our Time Travel Terrariums and Painting with Plasmavores, a brand NEW play, evening entertainment and panels, costuming competitions, oodles of quality panels and discussions, and so much more, it’s sure to be a hit. Even better? 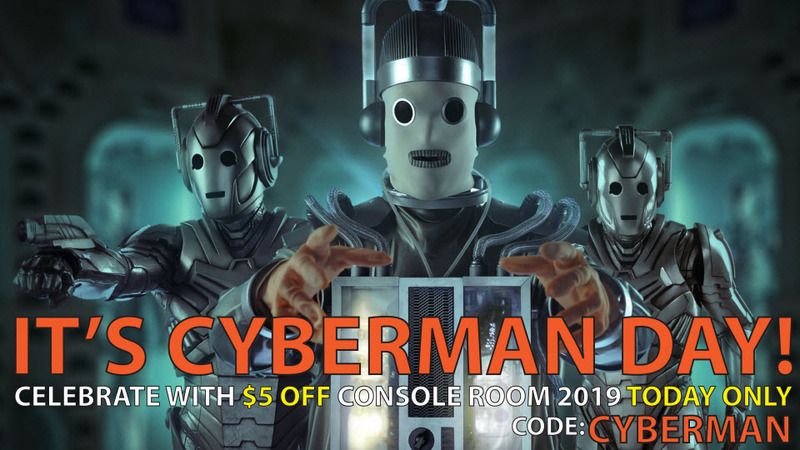 You can save TODAY ONLY on your weekend membership to CONsole Room 2019. Use code CYBERMAN to get $5 off, then stay tuned on social media and our website for lots of announcements over the next several days! We can’t wait to see you in January. REGISTER NOW! PANELISTS NEEDED! Do you love talking about Doctor Who? Is there a DW monster that you adore, or can’t stand? Are you into making costumes? Our programming ideas for 2019 are UP on our website and we need panelists to run them! Check out the list on our PROGRAMMING PAGE, then contact Programming if you’d like to speak at one or two (or more). You don’t need to be an expert, just passionate about the topic.